What’s the shelf-life of your products? Our products have a long shelf life, because our flour blends don’t contain any fats and therefore are very stable. Yes, of course. All foods made using my flour blends have excellent freeze-thaw properties. Just shape or roll out any unused dough and freeze. Then bake direct from frozen. Are your products really 100% natural? Yes. It’s very important to me personally. We only use the best quality ingredients bought from sustainable sources and accredited partners. I’m allergic to nuts. Can I still enjoy your products? Yes. Everything we make is completely nut-free and produced in a nut-free environment. Are your products safe for both vegans and vegetarians? My products are absolutely fine for vegetarians, but as some contain dairy, vegans should always take care to check the labels. We have quite a few products available which are dairy free and as we have lots of requests for more, we are always been busy working on new ideas. What are your main ingredients? I work mainly with cassava flours. I’ve got lots of knowledge and experience of these, and of creating new blends from them. The dough’s strength and elasticity makes very versatile mixes. It just goes to show you don’t need wheat to make good dough. Apart from gluten, which other allergies does your food cater to? 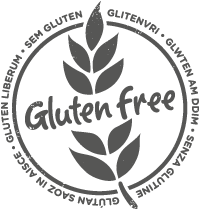 We try to cater for as many allergies as possible, so most of our products are soya and dairy free too. But please check the labels and product specification carefully before using any of our products to make sure that it is suitable for your diet. Do you use artificial colourings, flavourings or preservatives? No. Additives have no place in food, in my opinion, so we never use them.